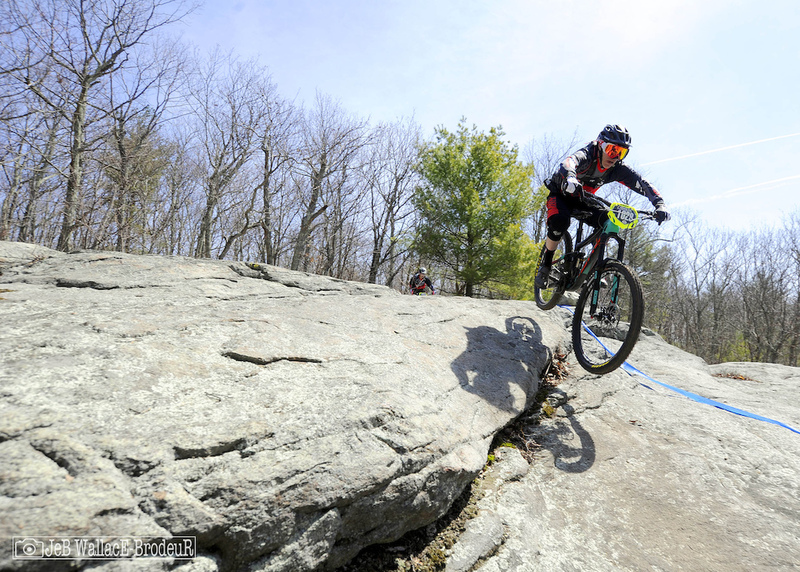 Gravity racing returned to the Northeast this past weekend as the Vittoria Eastern States Cup Enduro Series kicked off at Diamond Hill State Park in Rhode Island. 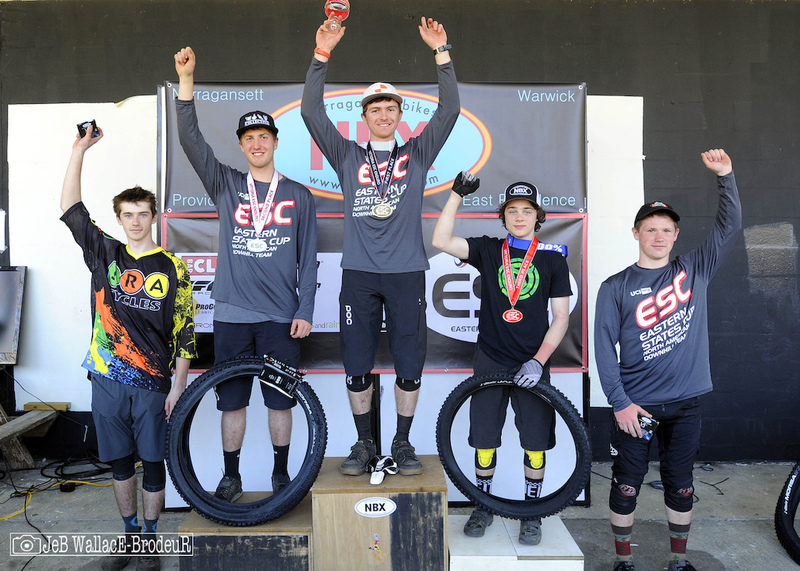 This was the ESC's first event in the nation's smallest state and it brought out a record number of entrants with nearly 220 racers battling in summery temperatures under bright blue skies. After a seemingly endless offseason, the stoke level was understandably high at the event. 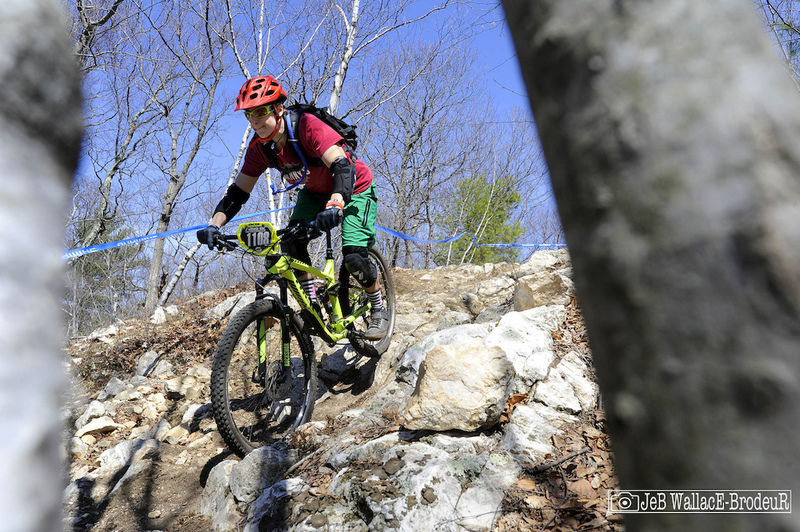 Diamond Hill neophytes had little or no expectations for Rhode Island riding, but a few runs on this well-built network sent the fun factor through the roof. 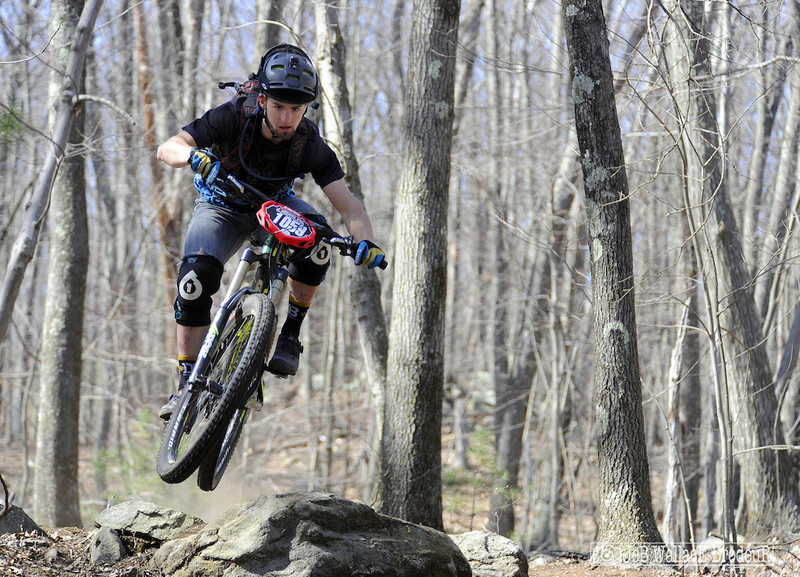 According to local rider Mike LeBlanc, from the Narragansett Bikes/ Rideyourassoff.com Enduro Squad, the trails at Diamond Hill came about when a very passionate mountain bike community convinced town and state officials to allow trail building about four years ago. 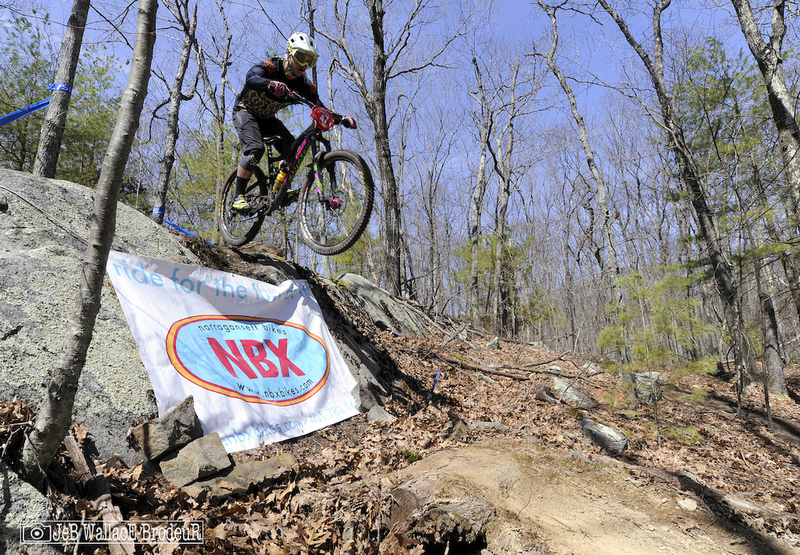 "I think this is the first enduro in the northeast that has been hosted on public land and run by an all-volunteer trails association, which is a pretty amazing thing considering that it happened in little Rhody, the flattest and smallest state in the northeast," said LeBlanc. The race was unusual in that it featured six stages instead of the customary five and there were no lift-assist transfers, as is typical at most venues. Stage One began at the high point of the park's western sector. Diamond Hill is rocky, and the top of the first stage was like the eastern version of Moab slick rock. Here, Brad Patches, riding for The Collective and Competitive Edge, flows down the smooth slabs. 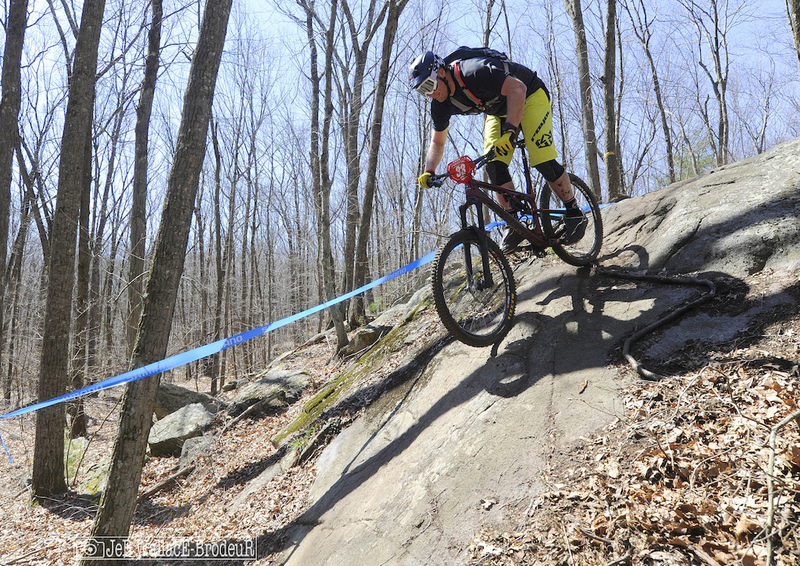 The opening stage ran about two minutes but packed a ton of features into its relatively short length, including this dramatic ledge running beneath a huge rock overhang, ridden here by Mike Fowler. The exit from the ledge, guarded by a tangle of slick roots, took out numerous riders, including pro Tom Flaherty, on race day. A lengthy pedal transfer took racers to the far reaches of the park and the start of Stage Two. This stage was the make or break stage for many riders and was more than twice as long as any other on the day. 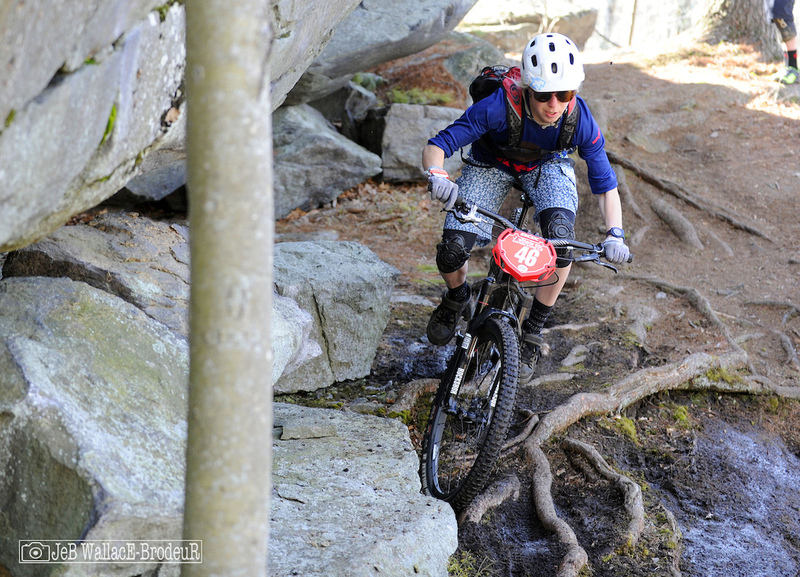 Things started innocently enough with a high-speed cruise through the woods and over some fun features, like this stone wall hit by second-place amateur Alisha Darin from CFM Cycles. 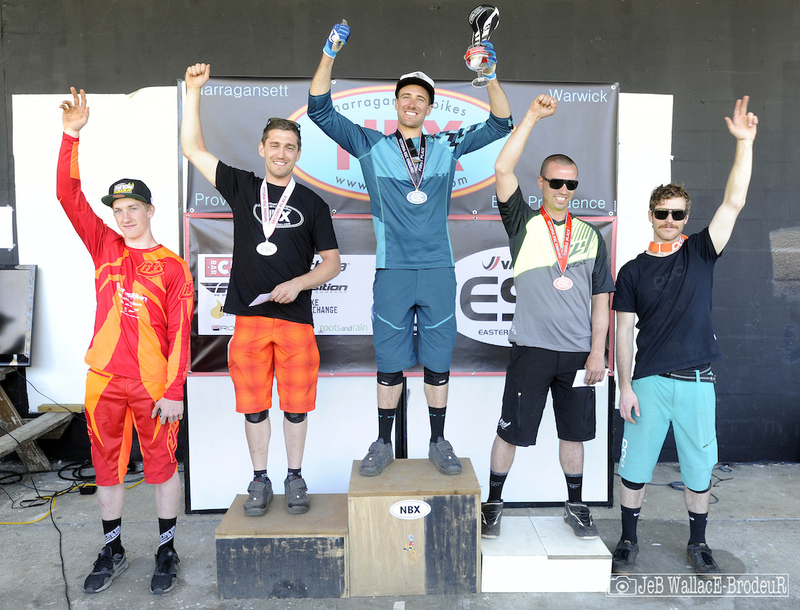 The middle of the stage was all uphill, probably the longest ever in an ESC enduro. 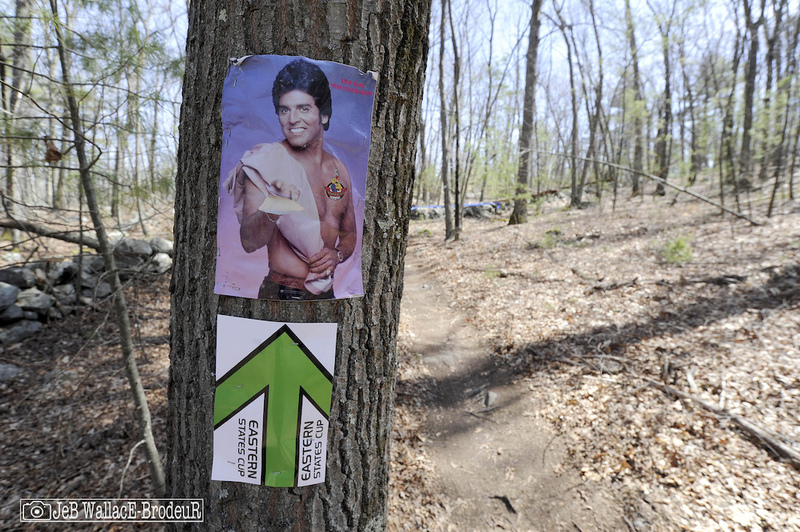 At least Erik Estrada was there to offer support for the suffering masses. Immediately after topping out on the climb, riders dropped into one of the most technical and steep sections on the day, ridden here by Forrest Kelly from the Twisted Cog Bike Shop. The stage finished with a flowy romp through rock features and berms. After climbing back to the top and through an incredibly well-marked maze of taped lines, racers faced Stage Three, the shortest of the day. This stage featured numerous man-made features with tables, berms, and drops sprinkled throughout. Fast Line Racing pro Paul Dotsenko, riding for Urge, Spank, and Fly, got things started with some high-speed air. A spicy rock drop in the middle of the stage was a popular spectator spot on race day. Stage Four featured a couple minutes of rambling through rock slabs and chicken heads. Simon Happy, of RST Velo Sports, rode his steed straight through the chunder. Even on relatively moderate terrain, the trail builders at Diamond Hill keep things interesting by throwing in jumps and gaps at every opportunity. 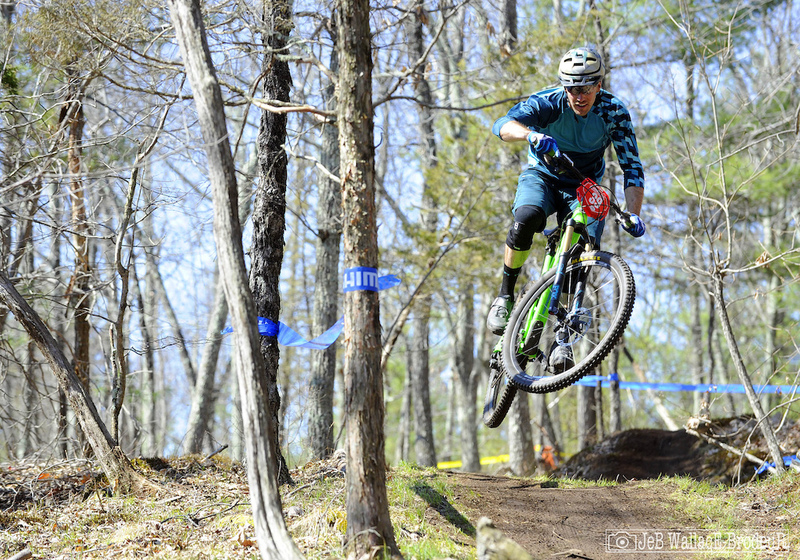 Andrew Lints, a successful collegiate racer from RIT and riding for Bicycle Express, embraced the air time when offered. 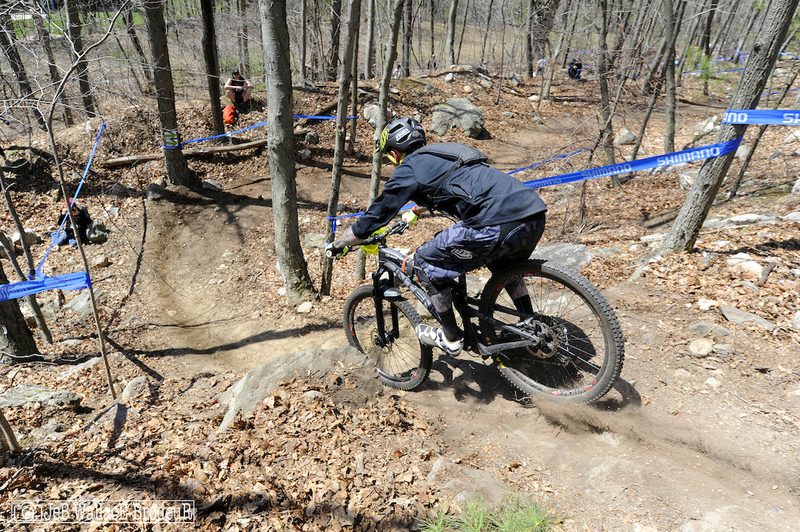 Returning for a final time to the top of the hill, racers faced the short and sweet bike park challenges of Stage Five. The track dropped precipitously down the hill with numerous drops and gap jumps. 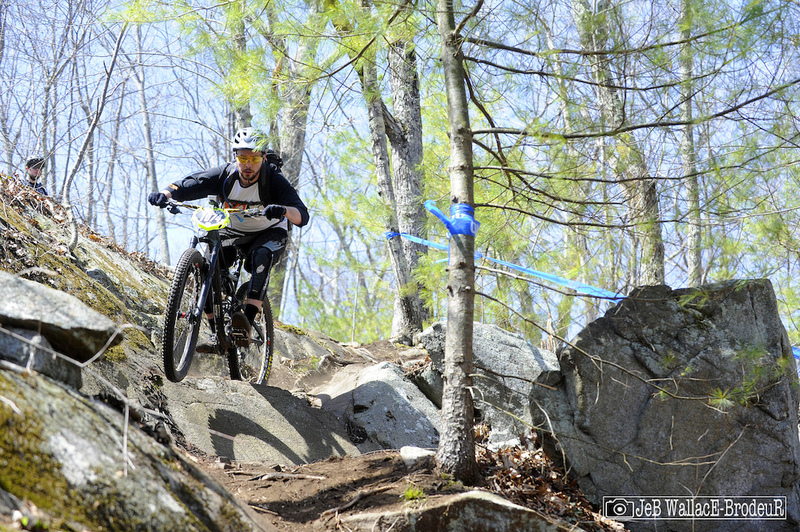 Always charging pro Isaac Allaire, who won events in both downhill and enduro last season, riding for Transition Bikes and Troy Lee Designs, tied for the win on Stage Five and finished fourth on the day. One of Diamond Hill's signature features starts with a steep rock roll down, hit here by Allan Bishop of Chainline Cycles. If you stay off the brakes on the roll down, it sets your speed perfectly for a gap jump off a wooden ladder bridge. Nathan Sterckx, from RST Velosport, threw some style into his effort. 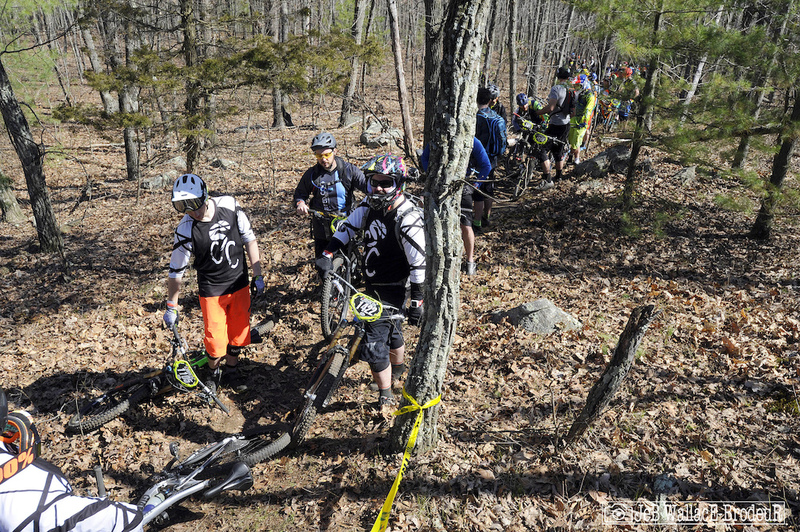 Immediately after landing the gap, racers were faced with a serpentine climb that caught more than a few off guard and in the wrong the gear. 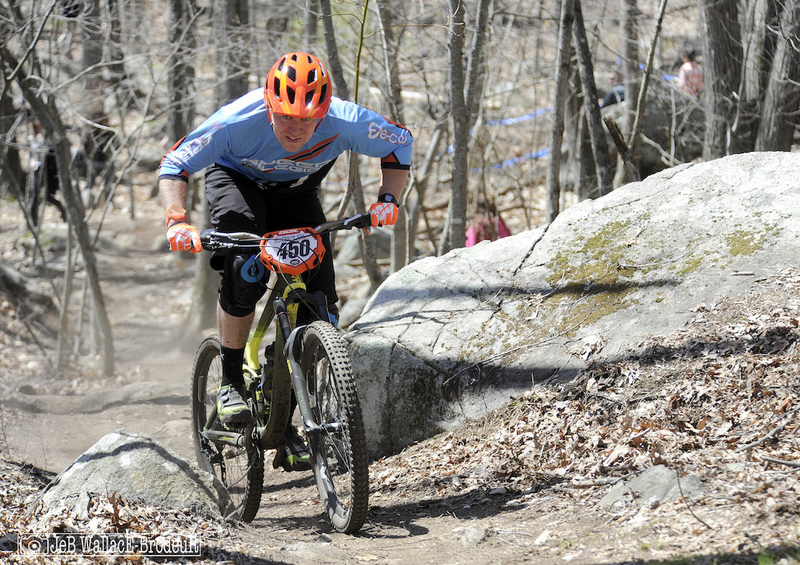 Speed Legion's PJ Mihalick was all business through the climb. The transfer to Stage Six was pretty epic and involved descending to, and crossing, the main road and taking the Fox Doss Seatpost Climber's Challenge up to the summit of the old ski area on the eastern sector of Diamond Hill. Stage Six had a very different character from the others with steep pitches and loose rocks everywhere. 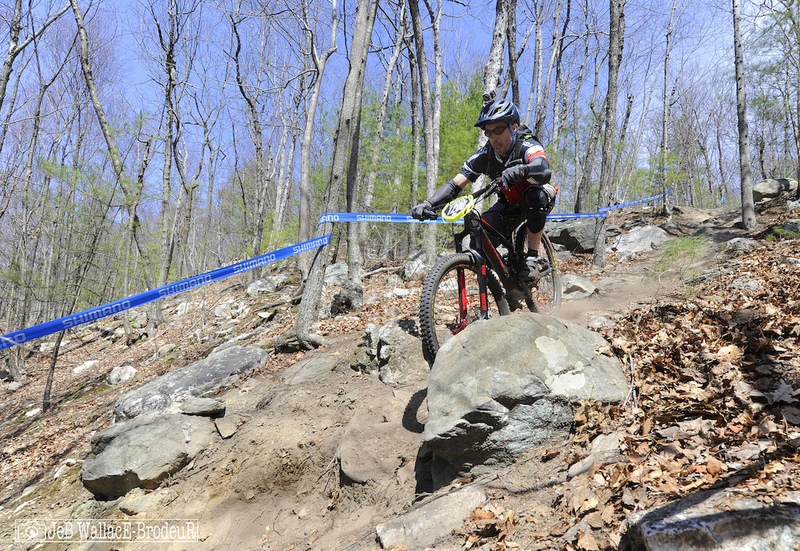 Veteran ESC downhill racer Stephanie Sowles, racing for Danny's Cycles, dropped into the rocky final stage in her first career enduro start. The stage finished with an alarmingly steep drop down a loose chute. 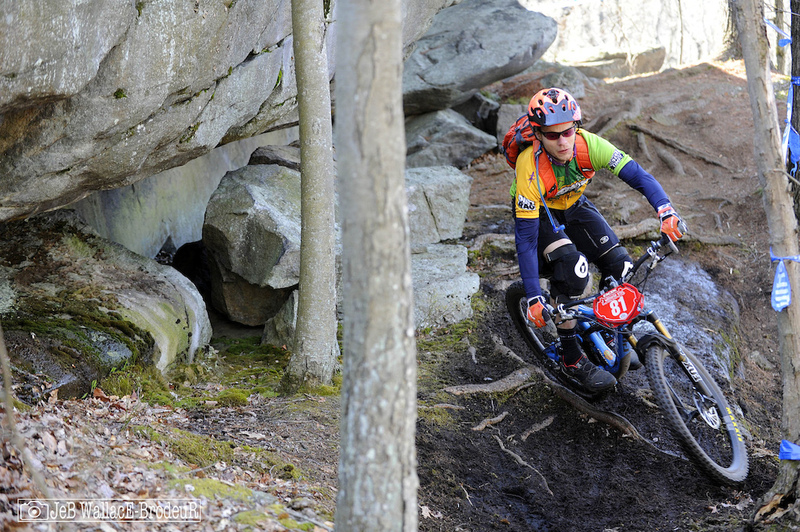 Multiple-time enduro champion Jonathan Salinger, riding for Bikeman, kept his weight back as he plummeted through the section. 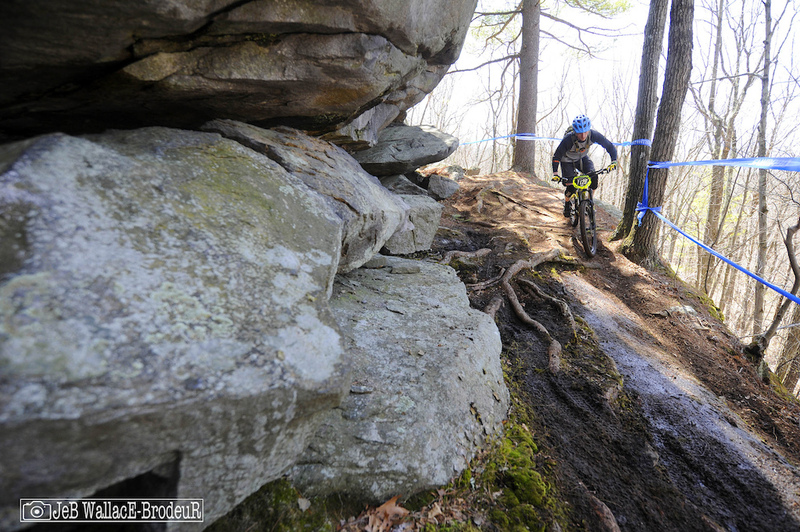 The chute finished with an extremely abrupt corner that took out more than a few riders. Veteran Aftershock Racing rider Tim Frederick aced his geometry exam at the bottom of the chute. Race day on Sunday couldn't have been nicer, a true taste of summer, except for no leaves on the trees. A long line of racers trudged patiently to the top of the hill for the start of the first stage. 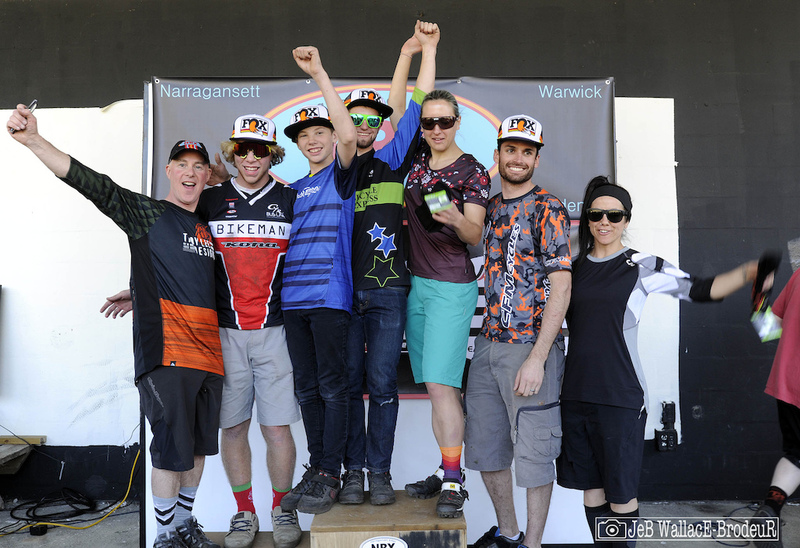 For the men, Yeti Cycles pro Jason Memmelaar, a consistent podium threat for years, took home the victory, besting a field of 35 racers. Memmelaar came out of the gate hot, taking the first three stages. A dual threat in enduro and downhill, Memmelaar really put the hammer down on Stage Two, putting seven seconds on his closest rival. 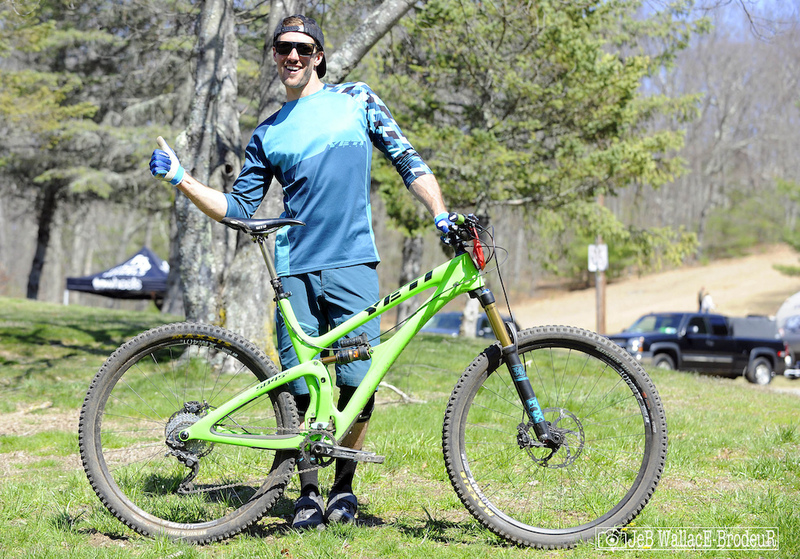 This was his first victory since winning the Blue Mountain enduro last June. With his performance on Stage Two, you might assume Memmelaar has been secretly training with the lycra crew. Surprisingly, he's been spending more time on a dirt bike: "I've been riding my Kawasaki KX250f more than my trail bike. It felt like a good portion of the trails were built by dirt bikes. I just imagined I was riding with the crew back home." Memmelaar was especially looking forward to checking out Diamond Hill. "Once I heard the race was in Rhode Island I wanted to go. I've never really spent any extensive amount of time in Rhode Island. I enjoy seeing new places when you've been on the scene as long as I have." Just a whisker behind Memmelaar was local pro Willem Cooper, riding for Voncooper, NBX, Deity and Troy Lee Designs. Cooper, no stranger to the Diamond Hill network, trailed Memmelaar by 11 seconds after the first three stages but came roaring back in the second half of the race to win the final three stages and lose the overall by just one second. Cooper admitted that his nerves got to him a bit at the start. "I was really nervous at the start of the race and it showed in my riding. As the race went on I settled into it and really just enjoyed my bike, focused forward and had fun. I learned a lot this weekend and hope to carry this momentum to more races. Enduro is new to me so I'm learning a lot every race. That's honestly the most fun part." Cooper also had some insight into the Diamond Hill vibe. "The local scene is strong in Rhode Island. Diamond Hill is a relatively new trail network and has brought a lot of awareness to the potential of mountain biking here. The town of Cumberland supports what everyone is trying to do with the land. 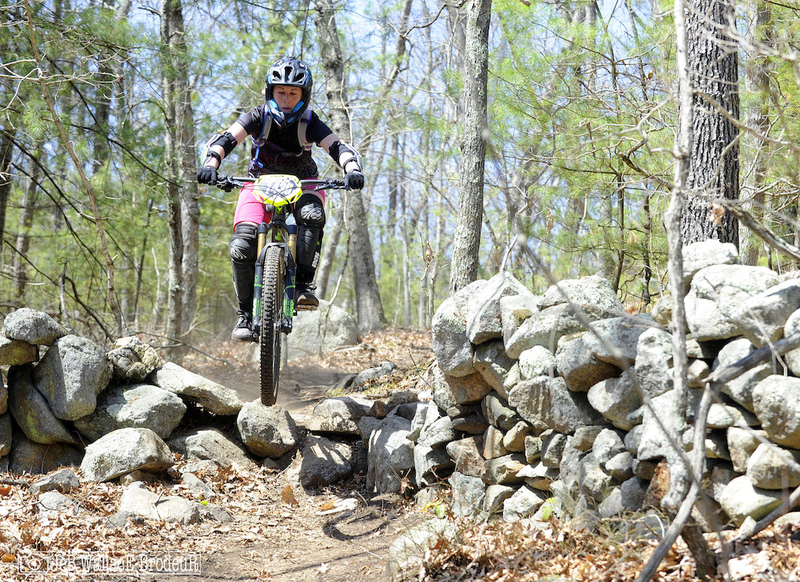 The idea is to make Rhode Island a mountain bike destination for all types of riders. I think you're going to see a lot of fast riders coming from this area before too long." 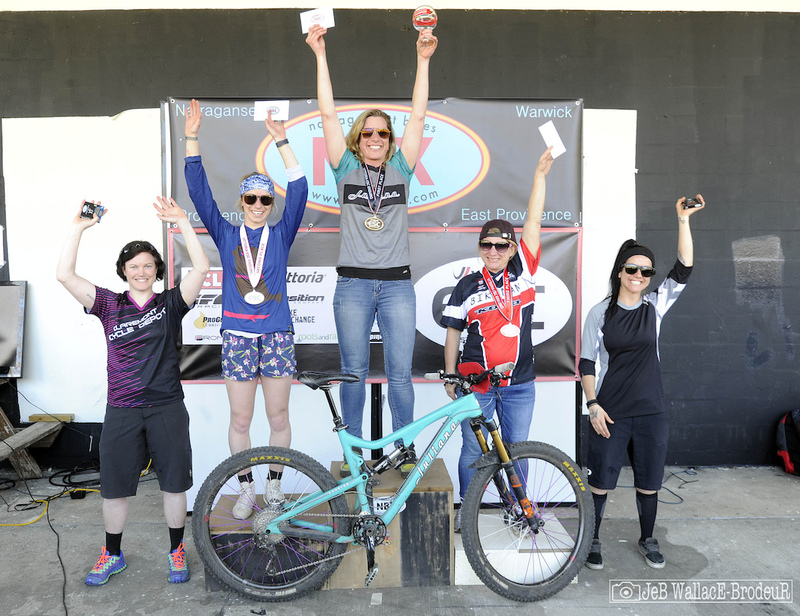 The biggest surprise of the day came in the third spot where Fast Line Racing's Ryan Lee, racing for Urge, E13, and Shimano turned in a career-best performance and first-ever podium. Except for being slightly off the pace on Stage Two, Lee stayed within a few seconds of Memmelaar and Cooper on every stage and finished just 11 seconds back. To explain his success, I jokingly asked if he'd been taking steroids in the off-season. "No steroids, just a lot of chicken! I actually didn't think I was going to do that good for the first race. It was totally unexpected, but I couldn't be happier. The trails were way more fun than I expected for a place that doesn't have a ton of elevation. Such good use of the terrain and the man-made features topped it off. I didn't feel like I worked that hard in the off-season but I guess I did enough. Hopefully, I can carry this momentum over to the longer enduros later this year." Taking the runner's up spot was POC and Skida pro Corinne Prevot. In only her fifth start, the former ski racer is making waves with several podium finishes under her belt already. Prevot won Stages Two and Five, crushing the field on Stage Two. Prevot was leading Alton by nine seconds entering the final stage but dropped a chain mid-stage and gave up twenty seconds on the final segment. Like many, Prevot marveled at the mid-season conditions at the race. "We're coming out of a mild winter here, so I happily welcomed 65 degrees and lots of sunshine. It seems so early to be racing bikes - even riding, so going fast was extra exciting! Diamond Hill blew my mind! Such great features everywhere, so casually integrated into the trails. All that pedaling whooped me and I definitely found myself in the pain cave a couple times throughout the day. I knew that hiccup (with my chain on Stage Six) cost me some time, but was psyched that I stayed in the mix." 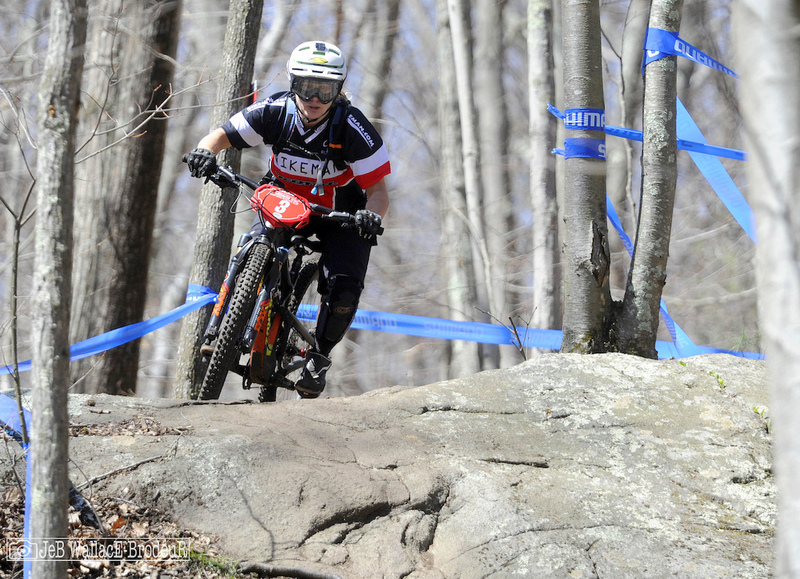 In the third spot was multiple-time Eastern States Cup downhill champion Mary Elges, riding for Bikeman. Elges' downhill background showed on the steeper stages with a tie for the win on Stage Five and a convincing win on the rugged Stage Six. Elges began to dabble in enduro last season and plans to race more events in the future. "Diamond Hill was a great venue. I was amazed at how well they accommodated the 200+ riders. I loved the courses, especially stages 3,5 and 6. Can't wait for my next race. 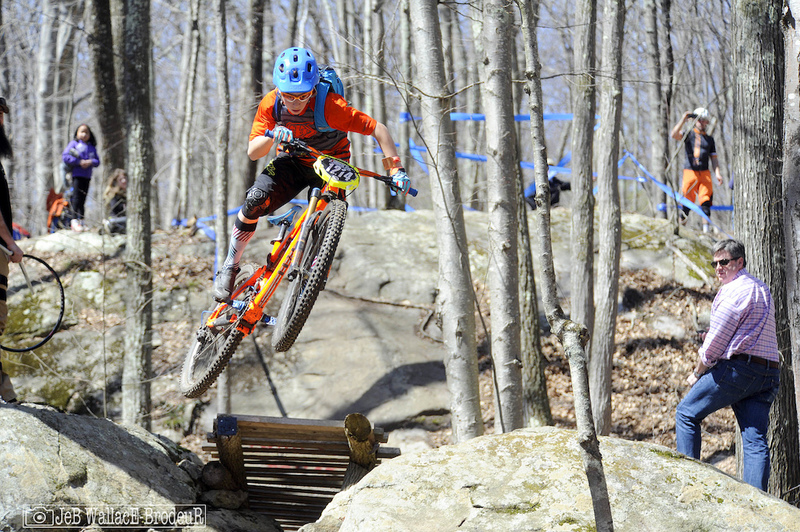 I'm planning to race enduro and select downhill races in the region this season." Okay kids, here's a new thing for your viewing pleasure. A full bike check for one racer at each race. If you know of someone with a sweet build that you think I should highlight in the future, let me know. For our first bike check, we might as well start at the top, with Jason Memmelaar. 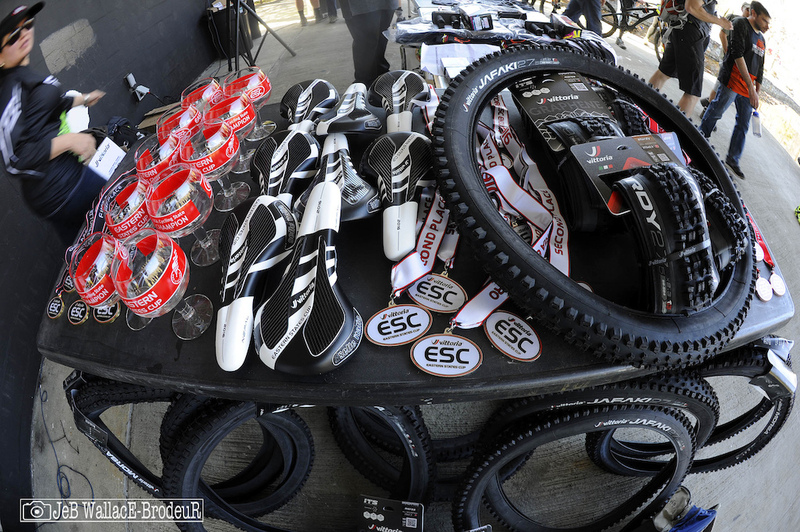 Come awards time, the usual pile of goodies from the ESC and its sponsors was ready for new homes. The winners in every class of the Fox DOSS Seatpost Climber's Challenge. 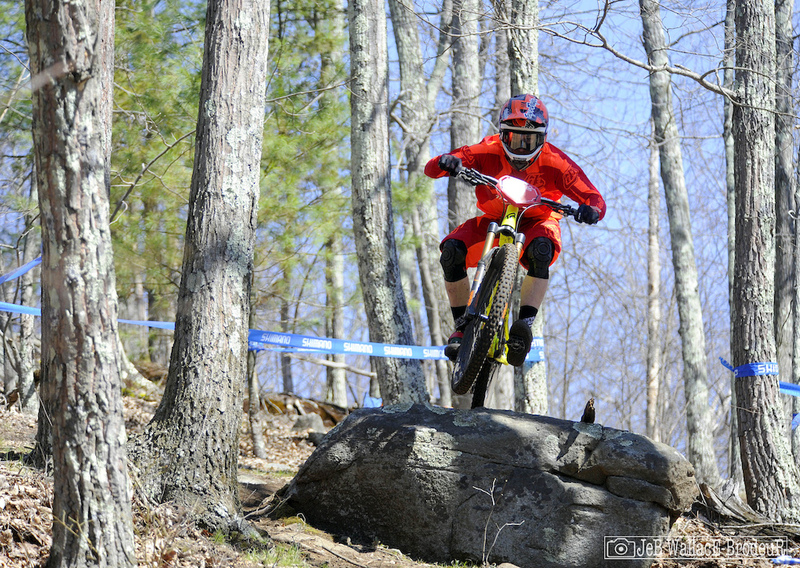 Diamond Hill was the domestic premier for the new Eastern States Cup North American Downhill Team, the first UCI-sanctioned, all-junior mountain bike team. The three members in attendance, Adam Robbins, Aidan Casner and Drew Wegiel all hit the podium, so the team is off to a great start. Robbins' performance was particularly impressive. After driving through the night from Ontario and not getting to inspect the course, his winning time would have tied him for fifth in the pro category. Well, you couldn't ask for a better start to the race season. Good times with great people, great weather and great racing. 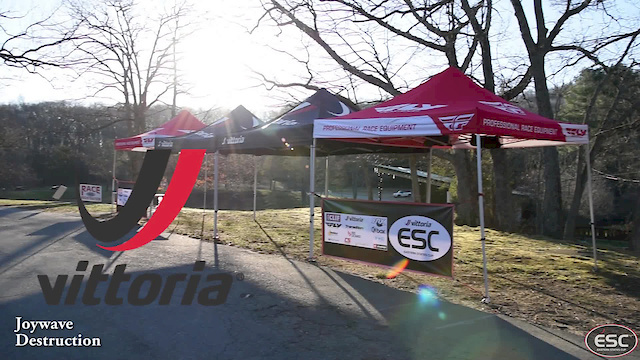 The next event on the Vittoria Eastern States Cup race calendar is the Victory Hill Enduro at Kingdom Trails. This is another new venue and has just been developed in the past year. Reports from Vermont's Northeast Kingdom say these tracks are fantastic. 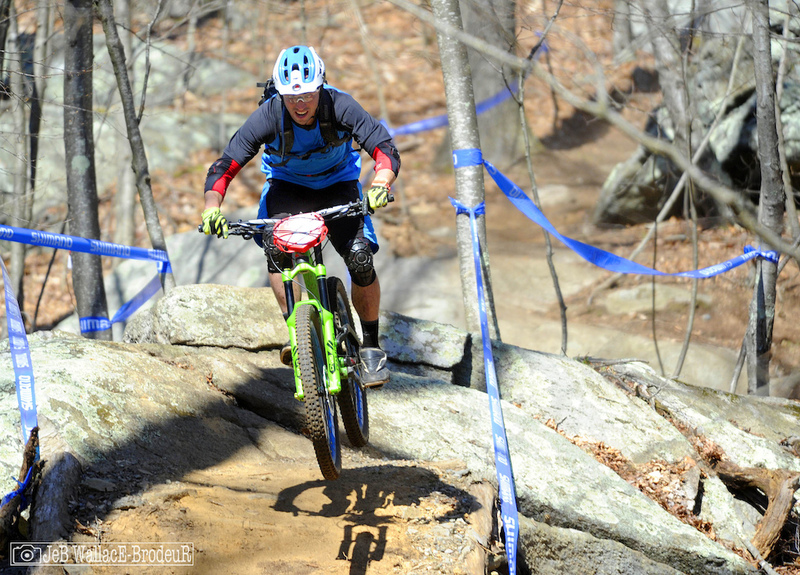 If you missed out on the Diamond Hill experience, local organizer will be hosting the 2nd annual Rhodeduro race on Nov. 7th after the conclusion of the Triple Crown enduro series. They are hoping to have a few new stages built for that event. Love me some East Coast tech! Why just one bike check? How about a few at a time? We plan on one bike check for every event this year. @Eastern-States-Cup: Not enough. More please!!! @Eastern-States-Cup: Woo! Maybe you guys'll put mine in there at a DH race?!?! 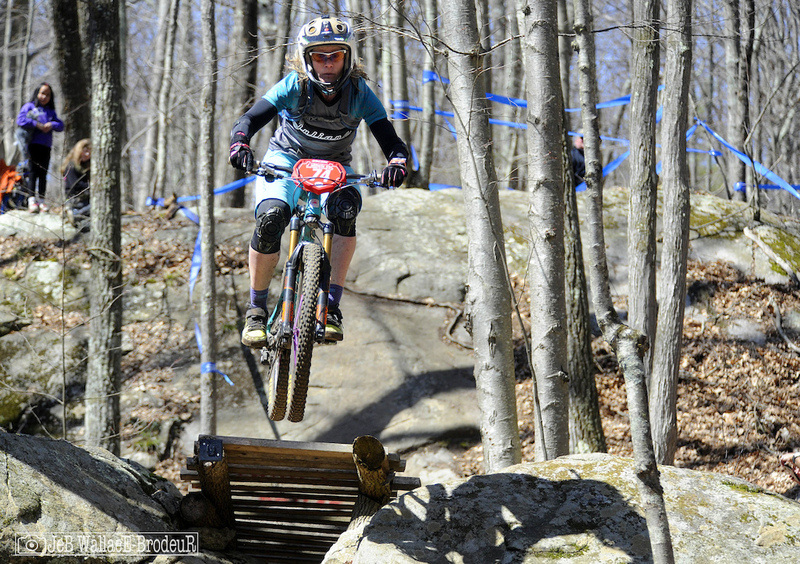 @Eastern-States-Cup Thanks for putting on a great race at a great venue! Look forward to more of these "earn your turn" enduros! Keeps us in shape! it looked pretty pedally. I think a 29er was a good choice! Super fun! Great write-up! I want to mention..John Beaupre's IMPRESSIVE win in the 50+ Men's Open class with a time that was 6 seconds FASTER than the winner of the 40-49 Men's (stacked with 29 riders, including an ex-pro or two..) That's a first since I started racing this series in 2013.... GO BIKEMAN! 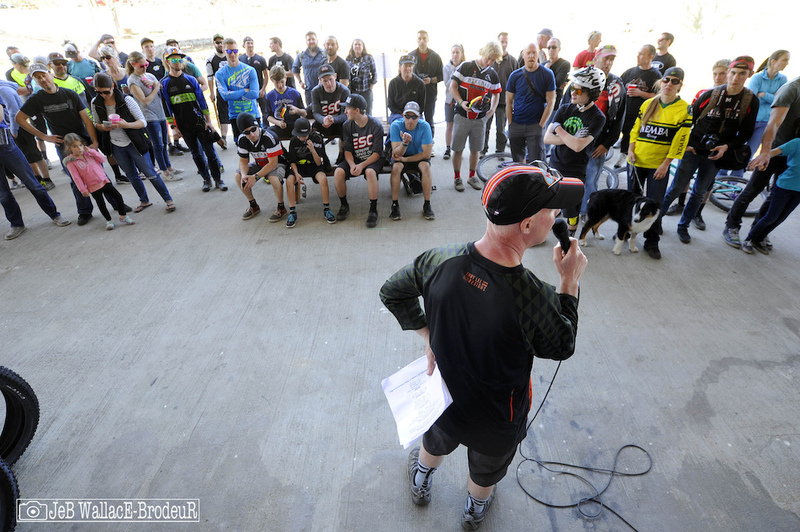 He also won the 50+ FOX DOSS Climbers Challenge, then announced the awards. The real question is, did he beat his son? 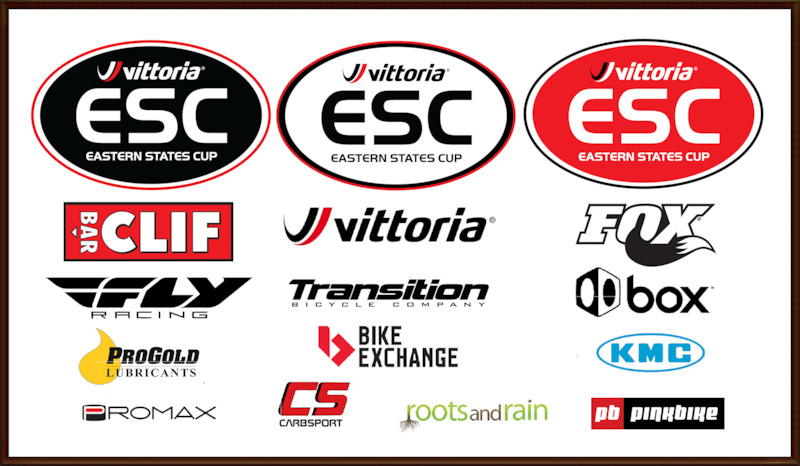 @Eastern-States-Cup: Sounds like an overall awesome event! Lucked out on the weather! He and his son tied! @Eastern-States-Cup. Thank you for an amazing weekend I had a great time even with my broken hand. I'm looking forward to Victory Hill and hopefully (fingers crossed) being all healed up. You should do a bike check on Glen Brimmer I rode with him race day he's an awesome dude and amazing rider with a pretty awesome set up. Thanks, we'll look up Glen at Victory Hill for sure. Fantastic start to the season. Diamond Hill is a freaking gem. The place proves you don't need tons of vert to have super fun trails. Wish I had something similar close to home. What a great place to ride. I kicked off my rookie race season at this race. It left me so excited for the rest of the season. From the staff to my fellow racers everyone was welcoming and encouraging. The course was such a good blend of flow and tech with some great bigger lines. It's got me including Rhode Island as a place to go when I need a weekend away with trails and excited to see the rest of the venues. 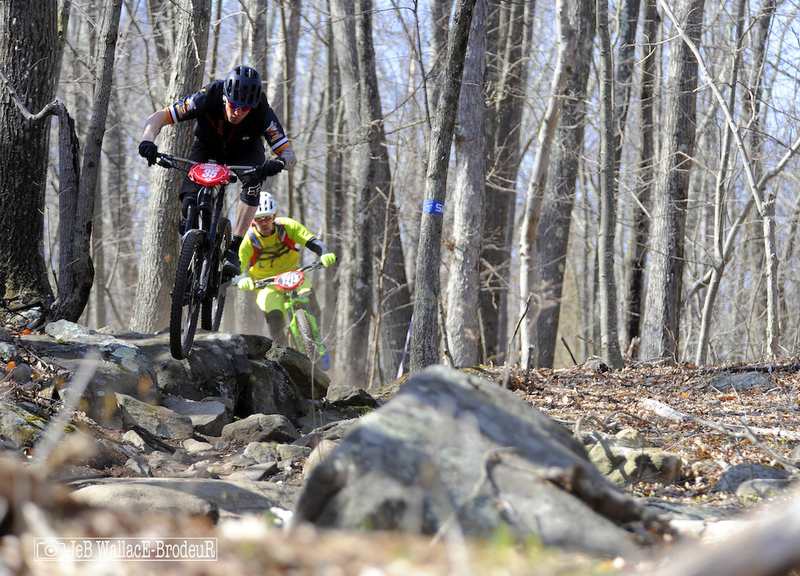 The Eastern Statss Cup Enduro series is awesome! There is much to be done with diamond hill. So much potential up there, happy to see this race go well. I was looking forward to racing but tore my calf surfing two weeks before. Nice job everyone and ESC Next time! This was a great event, and I'm glad I was a part of it. Big shout out to all the racers, especially my boy Arsenio who did his first ever mtb race, and Nick who won u 14. 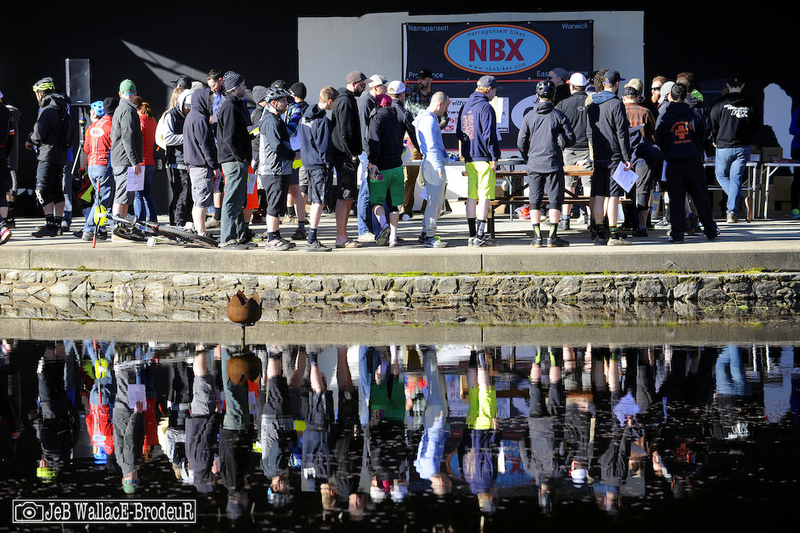 #NBX Bikes! Congrats, he really ripped it up Sunday ! What an awesome race! ESC, you guys rock. I think everyone was surprised with what little Rhody has to offer. Also, if you folks enjoyed this race make sure you show up for the 2nd Annual 'Rhodeduro' happening at DH on Nov. 6th after the conclusion of the Triple Crown. Ive heard trail Gnomes whispering something about all new, sic segments! We'll see everyone there for sure ! Pretty amazing what a small group of passionate riders/trail builders/race organizers can accomplish. Let hope more regions get inspired to do the same. @easternstatescup thanks for taking a shot on one of little Rhody's secrets. It was one hell of a race at Diamond Hill! This place is dialed and doesn't get the attention it deserves because of the zero lift thing. 230 registered 230 stoked! That's a win all day long. 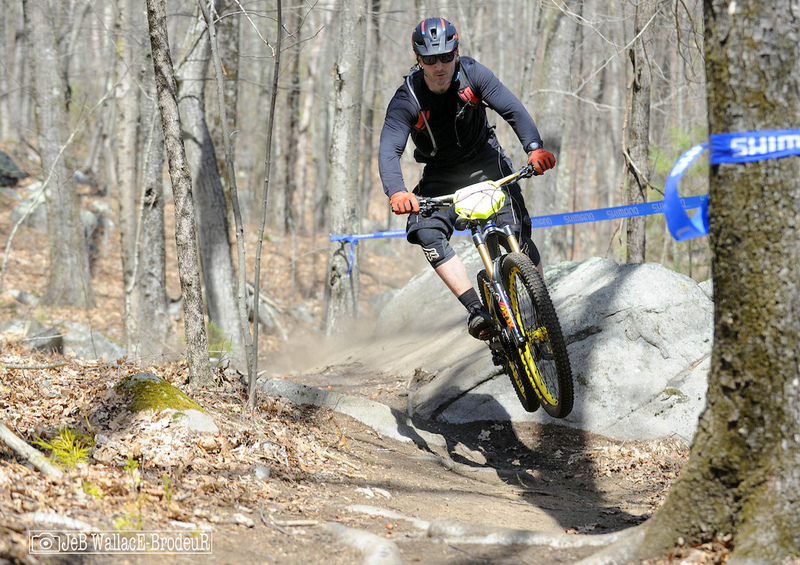 @eastern-states-cup One of the best Enduros I've done so far... so much fun! More of this please! We have 9 more ! This was a great event! Us girls had so much fun racing it up. The video for this race only shows one female rider towards the end. Come on Guys! Us girls would like to be better represented in the video and media footage. It would be truly appreciated!!!! Thank you Jeb for represented all cats and gender equally in you photos. hear hear - I cut my teeth riding on the East Coast and while the vertical doesn't typically compare to Mountain/West/BC there are unique technical challenges, twisty, well-worn trails, and those fun glacial boulders. Looks like such a nice spot to ride. All the trails were super fun and they were able to ride every weekend but one this winter. It's really easy to get to off of I90 too. It was a great event. 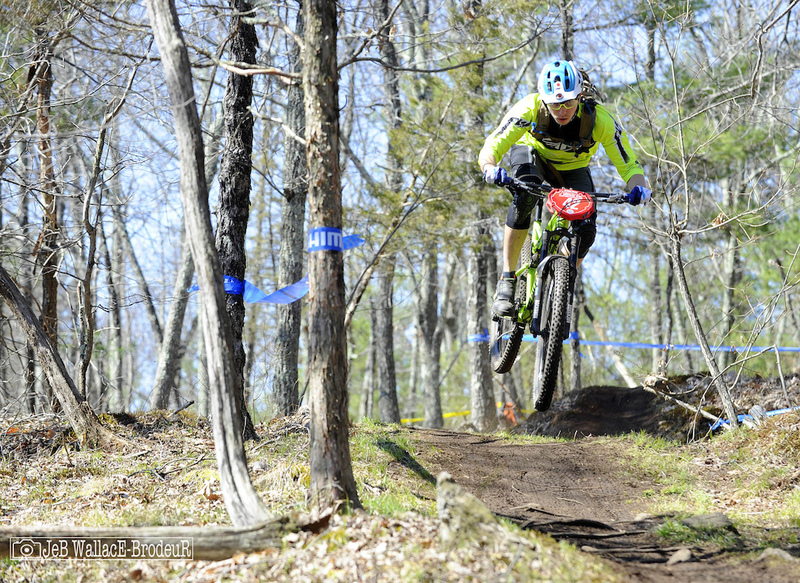 My first enduro race. Very organized and super fun. 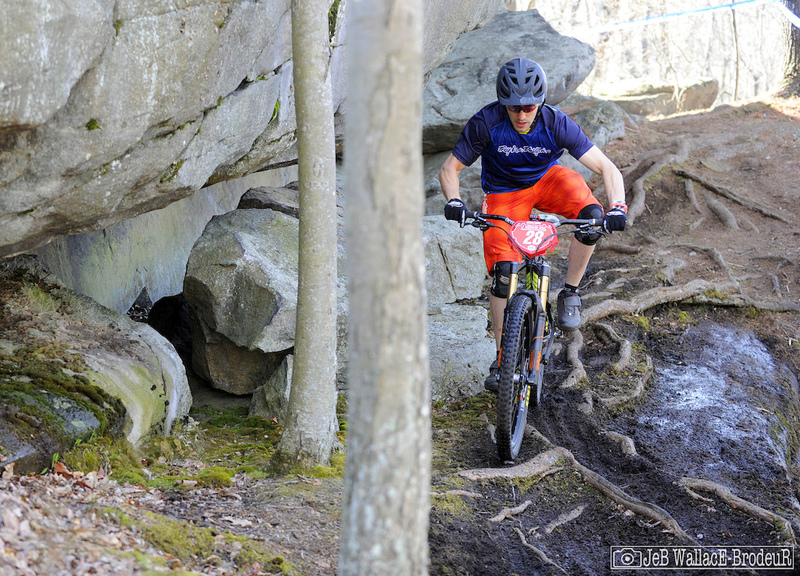 Such a well run event, and surprise, surprise, L'il Rhody has killer trails? According to these pics the riders were airborn %90 of the time. that's because they were! Most jumps and drops I've seen in an enduro, nothing crazy but super fun! I really like the bike check, it lets me know what the cool kids are riding. This place is very pedally but still a pretty cool place none the less. If the decents were twice as long this place would rule so hard. Well, there's no lifts, so if the descents were twice as long, so would be the climbs! It's an awesome all around terrain park. Great race! I'm disappointed that I have to miss victory hill, but I'll be ready for Blue in June! Great people, great trails, and great racing. ESC is the place to be this summer. See you all at Victory Hill. Looks like an awesome race. Looks like a good time!!!! They say you never go full enduro, but I think RI just hit peak enduro! Loving the candid shots Jeb, especially of the Storrs Center Cycle crew! Way to go George! great start to the season! Liking the bike check idea!! Looks like fun, and not too far from me. Oh fiiiiiiine, I'll enter the next one, gawd. Twist my arm. Had a great time, can't wait for VT! Excellent event!! Can't wait until the next race! Congrats @MOUNTAINbikerADAM Keep it up man!